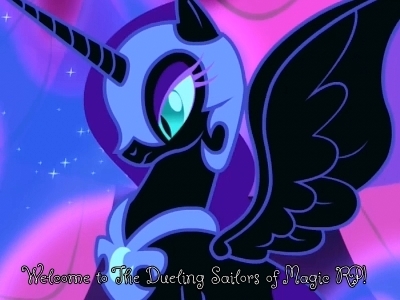 Welcome to The Dueling Sailors of Magic RP! Whoever you are, wherever you come from, you are welcome! Our official slogan: "I kill you, but you come back to life and kill me. It's pretty good, right?" The rules of the forum! Hooray! Also stickied on all other threads, but this is its home. Please read anything posted in this forum. Once the task/question has been completed/answered, the forum will disappear. Post a topic here if you have a suggestion or if something needs to be fixed. Post images of your OC's here! This also is where the mandatory forms for Original Characters are, so please come in! Post here, and a moderator will help you with your OC. You know the drill! Talk about the best ponies ever in here! They're making books of this?! Talk about the awesome comic series here! If it exists, it has been ponifed. Talk about the multitude of pony games here! Discuss the musicals of Sailor Moon. Discuss the live-action re-envisioning of Sailor Moon. Whether you like it or not, it's made a huge impact. Chat about YGO: TAS in here! Discuss any other shows you happen to like. Discuss other books you read. Yup, it has it's own section. Instructions for how to post are in the first post of "The Beginning of the Sailors! Gain Your Full Power!" These roleplays have been carefully planned out. Refer to the Rules Section for a better description. Partially planned out roleplays. Refer to the Rules section for a better description. These roleplays aren't planned at all. Probably the most popular section xD Refer to the Rules section for a better description. Post here any stories about your OC's, or links to places with said stories. Post anything here. Yes, ANYTHING. You may do the hula wearing a banana with coconut pie singing Moonlight Denetsu if you wish. The place to put all those games that are on every forum. This stuff is never getting deleted, it's too awesome! We move it here so it won't clog up the still-open threads.